The quest to make Britain a high-speed internet powerhouse is set to reach a landmark figure this month, with the 250,000th super-fast line about to be installed. There are currently 236,000 lines in the UK, but broadband analysts Point Topic expect there to be at least a quarter of a million lines offering speeds of 25Mbps or higher by the end of April. The revolution has been led mostly by BT, with 136,000 lines and Virgin Media with 86,000, while the other 4,000 lines are comprised of smaller ISPs. Over 75,000 new lines have been installed since the turn of the year, says Point Topic. But while the figure suggests progress is being made in this area there'll be no popping of champagne corks yet as this only represents one per cent of the broadband market in Britain. However, Point Topic expect the high-speed proliferation to take a more rapid turn, following the pattern of the upgrade from dial-up internet to the first broadband in the UK. 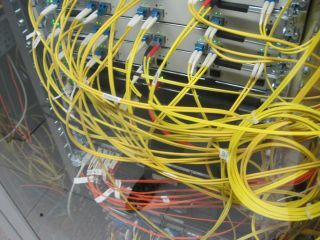 He says: "We went on from about one per cent to reach over 13 million broadband lines within five years. Now we have over 19 million. "It's dangerous just to assume that history will repeat itself, but it's still a good pointer to what will happen to super-fast broadband in this decade."